Wedding cakes are quite literally the centerpiece of any marriage ceremony. These cakes are true works of art that encapsulate a couple’s personality on a defining day of their relationship. In order to make such a marital vision come true, couples will need a dedicated baker who’ll meticulously take into account their specialized preferences and requests. A custom wedding cake is almost as important as saying “I do,” but it may not always be easy to get started on your initial design. If you’re planning your special event and need a wedding cake made in New Jersey, consider the following to help jumpstart the creative process. Below are popular wedding cake styles and trends in New Jersey, available for 2018! Nearly naked specialty cakes are available in New Jersey and can be custom made with a wide variety of options. This type of marital dessert looks very similar to that of a layer cake – if you thought it was you’ve fallen into its designed deception! The point of this cake is to give off the illusion that the layers aren’t covered at all. A very thin layer of icing is on the siding of the cake that’s only slightly visible. Enjoy this beautiful wedding cake without all the extra icing while getting an “x-ray” sight inside what makes your cake taste so great! Who says a cake needs to be perfectly level? These custom wedding cakes are a result of you and your baker thinking a little outside the box! An off-kilter or off-center cake gives off an unbalanced look that’s actually just as level as the next cake. Your slanted specialty cake in New Jersey will draw attention and impress every guest at your wedding. This specialty wedding cake is perfect for those who want to showcase their love for nature. Do you enjoy the outdoors and the beauty of the natural world? If you answered yes, then a nature-themed wedding cake may be for you! You can incorporate any element, area of the world, or something you find specifically beautiful – the possibilities are endless! These versatile weddings cakes are great for an outdoor New Jersey wedding by blending elegance with the perfect blend of rustic, natural beauty. Flower wedding cakes are always a fan favorite, be it in New Jersey or the rest of the world. While similar to nature-themed, flower cakes are much different than it may initially seem. The flowers you choose to incorporate on your cake are what deliver your own distinct style. Flowers can be arranged in thousands of colors, sizes and placements – choosing the perfect collection is the trick. If you’ve ever heard the saying, “a picture is worth a thousand words,” a flower does just the same – and a collection of them just amplifies the message. Bring sophisticated beauty from the natural world to your wedding cake. Metallic wedding cakes with black accents and layers are becoming increasingly popular as we move into 2018. Metallic colors, particularly golds and silvers, are being incorporated in many current cakes. These color finishes are without a doubt some serious eye-candy when featured on the main event table. The black accents, or entirely black-layered cakes, are also gaining traction in the custom cake world, reflecting long standing trends that permeate other areas of design. If you choose a matte black or metallic custom wedding cake in New Jersey, then you’ll definitely be up with the latest trends. When you hear the word “fruit,” does it make you think of a beautiful wedding cake? It should, because fruit-filled wedding cakes in New Jersey are a nice creative characteristic to any matrimonial event. Loading up your cake with fruit delivers an interesting flavor while incorporating some healthy components. Instead of icing, fruit can be used to top-off your cake with the perfect amount of decoration and eye-popping color. There’s a reason why these cakes remain timeless favorites. 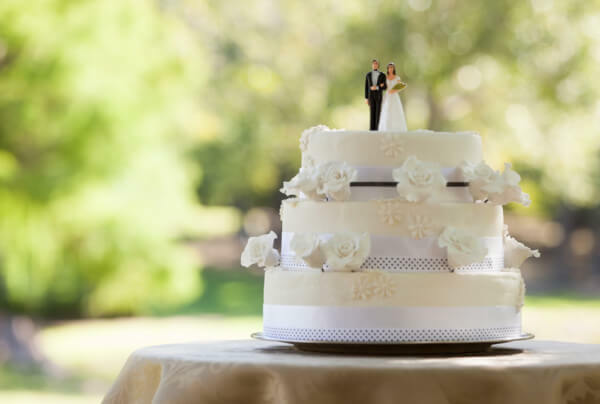 Classic specialty cakes in New Jersey are always available for any wedding. These cakes can range from simple to heavily intricate, but always refined and indelibly beautiful. The perfect wedding cake is important to your wedding, and you’ll need a baker who’s capable of making your dreams come true. Bring this memorable day to the next level with help from Calandra’s Bakery. 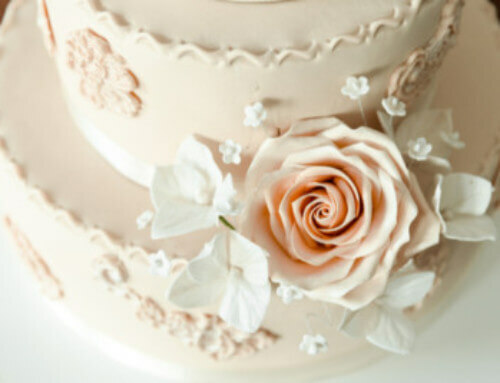 Our experienced cake designers know exactly how to create the perfect cake for your wedding. Contact your nearest Calandra’s Bakery location for specialty cakes in New Jersey that look good and taste great today! Please feel free to view our blog and the other products we offer to learn more about Calandra’s!